That camera in your pocket is being well looked after. The Photography Show 2019 isn't just about DSLRs, mirrorless and medium format maestros. Look beyond the pro-grade kit and there's a thriving community for those who want to take photographs on their (gasp) mobile phone. Now, those who have been reading Digital Camera World recently will know that we are quite partial to mobile phone photography. Our best camera phone guide shows off devices that no longer make photographers chuckle but sit up and take interest, especially with the huge technical strides being made with multi-camera arrays like the five-camera set-up of the Nokia PureView 9. With that, there are some great mobile phone accessories and add-ons you can purchase to enhance your camera phone shot. Here's our pick of the best we've see so far on the floor of The Photography Show. It may have been around for just over a year now, but that hasn't blunted the impact the GorillaPod Mobile Rig has. Ideal for vloggers who want to shoot steady video on the go, or camera phone users who just want a bit of stability in their shots, without having to carry around a chunky tripod, the Mobile Rig is your flexible friend. The rig allows you to fix a mobile phone on to the middle of it, as well as a light and mic on each of its arms. Buy the GorillaPod Mobile Rig now for around £90. When first announced at the latter end of 2018, the MOZA Mini-MI raised some eyebrows as it was a world's first in the gimbal world. The accessory is the first mobile phone gimbal which will actually charge the phone while you are using it. This only works if you have a phone that can be wirelessly charged, otherwise there's a charging cable also built into the device. This means that you don't have to worry about your battery running dry when you are on the go. Buy the Moza Mini-Me now for around £100. No, Gandalf hasn't taken up a second career as a influencer. SelfieWizard is a fun little idea that acts like a photo booth at events. Connect the unit up to a TV or projector and guests can then upload their photos to the screen (or printer) without having to use an app. It's a pretty frictionless way of getting guests to interact at whatever event you are putting on. There's also a 'little brother' version of the service called Selfie Ninja, that allows wireless printing from iPads and Windows devices. Find out more at SelfieWizard's website. 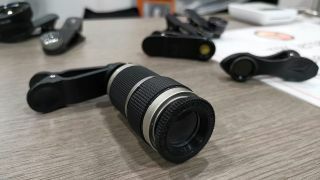 Supplier of mobile phone lenses The Right Kit (TRK) showed off something of a whopper at The Photography Show 2019. As well as a number of lenses they have had out for a while, there was an 8x telephoto lens that simply clips on to whatever phone you have. It takes a little bit of fiddling to get it over the lens without any black areas surrounding it, but once you have it on the effect is pretty decent. There's also a 12x option available, a 15x macro lens and a whole bunch of fish eye varieties. These add-ons are cheap, too - expect to pay around £10. Formerly a Kickstarter darling and now a fully fledged product in its own right, Lemuro has been busy creating mobile phone cases that come with the ultimate photography add-on - a powerful lens. The cases are available for iPhone X, iPhone 7/8 and iPhone 7 Plus/8 Plus and you there are four detachable lenses to choose from. Buy the Lemuro case and lenses now. This is another gimbal for your smartphone that offers something a little unique: it extends an impressive 18cm, which means that you could also use it as a (sorry) selfie stick, if you wanted to. It works with an accompanying app and allows you to switch from the front-facing camera to the rear camera seamlessly. Buy the Vimble 2 now for $119. 3 Legged Thing is a company looking at the tripod market a little differently, injecting a decent bit of fun into the market. Its Iggy Mini tripod made an appearance at The Photography Show - pair it with the £10 The Cradle phone add-on and what you have is a brilliant mini tripod for your smartphone photography. Buy 3 Legged Thing Iggy and phone mount for £24.99. There was no shortage of mini tripods at The Photography Show, all ready and waiting to keep your phone on the straight and narrow. The Manfrotto PIXI Tripod needs a Universal Smartphone Clamp for it to be phone compatible, but once you have paired the two together you have a bit of essential vlogging kit. Buy the Manfrotto PIXI Tripod and Universal Smartphone Clamp for £39.95. Need a light to work with your smartphone, then this little gizmo may well be for you. Compatible with a smartphone, the torch uses 16 individual LEDs to light up to 800 lumen, is waterproof and has a bigger battery than its predecessor. Buy the LitraTorch 2.0 now for around £80.